The Progress & Freedom Foundation Blog: Recap of PFF Hill Event on "Next-Generation Parental Controls & Child Safety Efforts"
Recap of PFF Hill Event on "Next-Generation Parental Controls & Child Safety Efforts"
Yesterday up on Capitol Hill, I hosted a very interesting discussion about "Next-Generation Parental Controls & Child Safety Efforts." I thought I'd provide a quick recap here for those who couldn't attend. [Note: audio of the event will be up shortly at the link above and transcript is in the works.] The event featured Steve Crown, Vice President and Deputy General Counsel of Microsoft Corporation's Entertainment & Devices Division; Dane Snowden, Vice President of External & State Affairs of CTIA - The Wireless Association; and Stephen Balkam, Chief Executive Officer of Family Online Safety Institute. Steve Crown of Microsoft kicked the show off with a terrific overview of some the current and next-generation parental control tools and awareness efforts that Microsoft is deploying to help empower parents and keep kids safer both online and in gaming environments. Crown outlined Microsoft's 5-prong strategy regarding how they have approached these issues on the gaming front, and I think it represents an excellent model of how sensible industry self-regulation and "best practices" can go a long way toward addressing concerns that many parents and policymakers have. The five strategies Crown outlined were: (1) Respect both the freedom of game creators and freedom of choice for game consumers; (2) empower parents with ratings, tools, and information; (3) use independent ratings (like the ESRB) to label content; (4) require all games be rated before they can be used on a platform so that parents can implement blocking controls; and (5) respect regional laws and rating systems in different parts of the globe. In my book on Parental Controls & Online Child Safety: A Survey of Tools & Methods, I've documented many of the empowerment tools that Microsoft has deployed in recent years to make this empowerment vision a reality. One of the most important things MS does on its XBox 360 console is to provide an immediate "out-of-the-box" prompt for parents to set up parental controls and establish other limitations on online chat, spending, or Internet access. Microsoft announced another cool new feature in November 2007, the "Family Timer." It lets parents limit how and when children play games on the console. This is similar to the time management tools Microsoft offers in its Vista operating system for PCs. Incidentally, my wife has asked me to start using the Family Timer on our XBox -- not for our kids, but for me! This particular 40-year-old man is still a big kid at heart. Crown also stressed the importance of "deep cooperation and coordination" when it comes to making parental empowerment a reality. For example, when announcing the Family Timer, Microsoft also launched a new awareness campaign in conjunction with the Parent Teacher Association (PTA) referred to as the "Is Your Family Set?" campaign At the same time, Microsoft and the PTA also rolled out a new "P.A.C.T." agreement form that parents and their children could sign to reach an agreement on acceptable video game usage in the home. 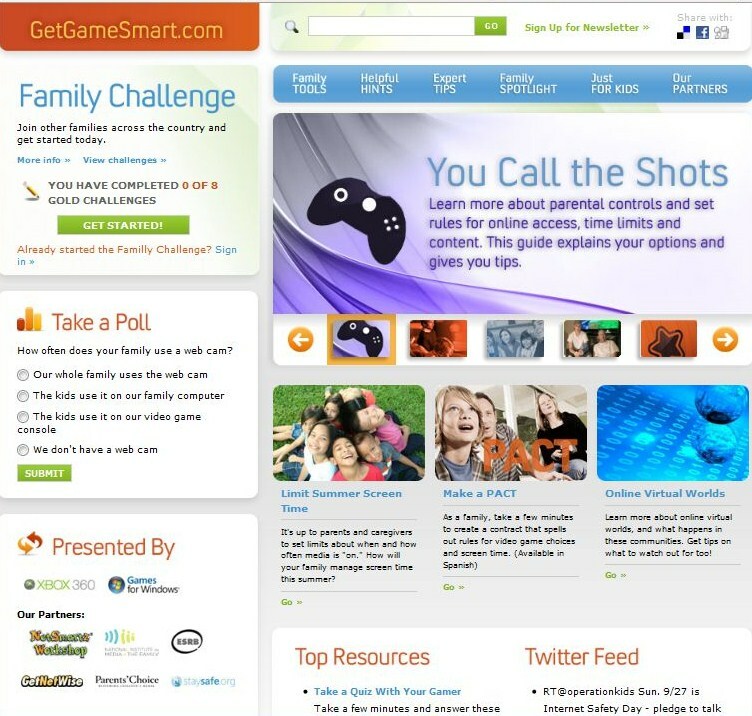 To bring all these efforts together and give parents a sort of "one-stop shop" for all these gaming tools and information, in early 2009, Microsoft launched a new portal, "Get Game Smart.com." The GetGameSmart site provides instructions and video tutorials about how to set up parental controls and family settings, tips and advice from child safety experts, a frequent newsletter, and much more. Again, "cooperation and coordination" was central to the Get Game Smart effort, with over 15 partners being involved. Moreover, Crown pointed out, cooperation and coordination has also been essential to the efforts of Microsoft and others in the gaming industry when it comes to "point of sale" awareness-building about game ratings. Obviously, game developers and console makers can't have staff on hand at every store where games or consoles might be sold. Consequently, it often falls to sales clerks and others in retail stores to convey ratings info. Luckily, because of the partnerships that have been struck between various stakeholders all along the food chain, public awareness and use of ratings has grown rapidly. Microsoft, the ESRB, and others in the gaming industry have worked with retailers like Best Buy, WalMart, and many online vendors to make sure relevant ratings information is used at the point of sale to inform parents or limit underage access to games rated for more mature audiences. 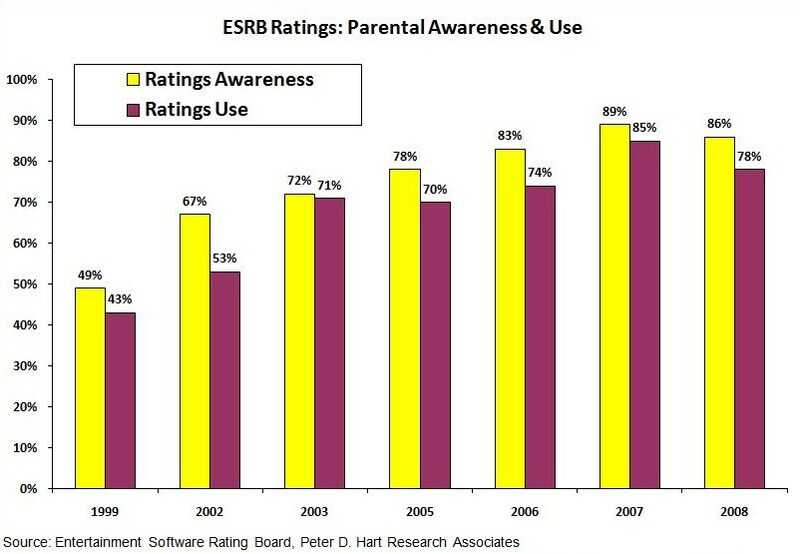 The chart below illustrates the dramatic increase in ratings use and awareness since 1999 -- from 49% awareness in 1999 to 86% by 2008. That's an incredible success story in terms of how industry self-regulation and best practices can go all long way toward addressing the concerns of parents and policymakers without denying the public access to a broad range of games for all ages. Also on hand at our Hill event yesterday was Dane Snowden of the CTIA - The Wireless Association. Snowden also stressed the importance of partnerships and coordination among many diverse players to build awareness about parental controls and online safety in the mobile context. Snowden pointed out that there are well over 600 different mobile communications devices on the market today, which makes devising controls a daunting task. But both the wireless industry and independent vendors are responding with a wave of new integrated tools and add-on services that can help parents control handset use and online interactions. Under these guidelines, participating carriers agree to develop content classification standards and educate consumers about the meaning of the chosen categories and ratings. The Notice describes the bifurcation in these content classification guidelines between "Carrier Content" and content available from other sources. The guidelines for Carrier Content cover materials that are available through a carrier's managed content portal as well as third-party materials for which customers may be billed directly by their wireless carrier. These materials are divided into "Generally Accessible Carrier Content," which is available to all consumers, and "Restricted Carrier Content," which is not available to wireless users under 18 years of age without specific parental authorization. Many major wireless carriers have already announced their plans or policies regarding such content or developed family tools to help parents protect their children. Market leaders AT&T ("SmartLimits" and "Media Net"),Verizon Wireless ("Family Locator"), T-Mobile ("Web Guard"), and Sprint ("Net Safety") already have excellent parental control services and websites up and running. Dane Snowden also noted that a vibrant marketplace of independent parental control tools is now thriving on many platforms, including Apple iTunes apps and Windows Mobile apps. Thus, just as was the case in the traditional PC world, we can expect to see parental control tools integrated within networks and devices and then also on top of networks and devices. That's the best of both worlds since it gives parents a lot of flexibility and options. Finally, my old friend Stephen Balkam of Family Online Safety Institute placed all these developments in a broader historical context. He believes we are finally seeing a shift from a "fear-based approach" to online safety toward a "fact-based approach." Balkam cited the early fears and techno-panics that motivated misguided and ultimately unconstitutional laws such as the Communications Decency Act of 1996 and the Child Online Protection Act of 1998. He also pointed out just how irrelevant such laws would have been even if they had remained on the books in light of the recent rise of problems like cyberbullying and "sexting." To address such concerns, Balkam stressed the importance of media literacy and digital citizenship and the need for a "Web 3.0" approach along the lines of what Anne Collier and Larry Magid have outlined in their work on the issue. Balkam also put in a plug for the "School and Family Education about the Internet (SAFE Internet) Act" (S. 1047), which was introduced in the Senate by Sen. Robert Menendez (D-NJ) and in the House by Rep. Debbie Wasserman Schultz (D-FL). The measure proposes an Internet safety education grant program that would be administered by the Department of Justice. Balkam argued, and I agree, that such education and counseling-based approaches represent the better approach to a "criminalization" solution. Cooperation and coordination are essential when devising parental control solutions and trying to build awareness of them. Additional parental empowerment tools are great, but focusing on striking the right balance is crucial. Parental empowerment tools must be both sophisticated and simple to use at the same time. Education is absolutely essential in every child safety context. Whether it's potentially objectionable content or unwanted forms of communications, we must talk to our kids and better prepare them for life in the Digital Age. The best "parental control" is parental interaction and ongoing conversation with our kids.